The reason Steph and I are in here in Malaysia is because Steph and endurance.net have been invited to participate in the inaugural Royal Kedah International Invitational endurance ride. This is being put on in conjunction with His Royal Highness the Sultan of Kedah's 79th birthday celebrations and Visit Malaysia 2007 - it's Malaysia's 50th year of independence. This event is part of efforts to raise international awareness and interest in the World Endurance Championship 2008 (WEC 2008) which will be held in Terengganu state in November 2008. There's a 120 km FEI ride starting at 5:30 PM Friday, and an 80 km ride (5:30 PM Friday) and a 40 km ride starting 7:30 AM Saturday. There will be 80 riders, including 15 international ones (including Steph). Sunday March 10 is the closing ceremonies which will include a reception for the Sultan of Kedah and his visiting dignitaries, including "gulf state royalty." Stay tuned for that! Two-thirds of Malaysia is jungle; it contains the oldest rainforests in the world, over 130 million years old. The jungles here contain the world's largest flower, Rafflesia. The entire plant is just a flowerhead, and it can be 3 feet across and weigh 19 lbs. It's beautiful but very stinky, smells like rotting flesh. Worse than durian, I wonder? It only blooms for a week, then it shrivels up back into the earth. The jungles here have the tallest tropical tree, the Tualang. There's a Malaysian legend version of Big Foot: in the late 80's or early 90's, 2 Americans found 17-inch human-like footprints. Native guides were not surprised; they said it's a sub-human covered with hair who roams the jungle. If I see one of these during a ride, I will not tell anybody, just as I have never said if I've seen evidence of Big Foot in the Pacific Northwest. You know, they'd be captured in the name of science, put on display, taken care of under lock and key for their own good and health. Mum's the word on any Big Foot sightings. Prehistorically, Eastern Malaysia has produced a human skull from 35,000 BC. Boy would I like to touch something that old! Historically, Malaysia's located at the convergence of 2 major sea routes linking India and China, so it's always been a coveted trading area. It came under the control of the Portuguese in the 1500's, the Dutch in the 1600's, the British in the 1700's (all sound familiar? ), till 1957 when Malaysia became independent. Piracy was common in the old days, and it's a growing concern now. The Strait of Malacca (runs along the southwest coast of peninsular Malaysia, with Indonesia across the way) is one of the most dangerous shipping corridors in the world. John Burnett wrote a very good book on modern piracy, Dangerous Waters: Modern Piracy and Terror on the High Seas. Malaysia is made of 13 states. It's the size of Japan but has a fraction of the population. Malaysia was and still is the world's primary exporter of natural rubber and palm oil, and is also big in sawn longs and timber, cocoa, pepper, pineapple, and tobacco. 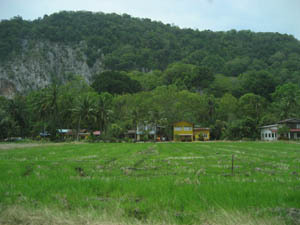 Rice is a primary product here in Kedah state. Logging only began during the 19th century to make a substantial contribution to the economy. Today an estimated 59% of Malaysia remains forested. The government's commitment to protect the environment and the ecological system keeps forestry resources managed on a sustainable basis. Tin and petroleum are the 2 main mineral resources in the economy. Malaysia was once the world's largest producer of tin until the collapse of the market in the early 1980's. In 1972 petroleum and natural gas took over from tin as the mainstay of the mining sector. The Malaysian government is similar to Britain's: there's a parliament, and a federal constititional elective monarchy. Each state has a sultan, and every 5 years a new sultan becomes king. (Steph's friend is now the current King of Malaysia :). He's supposed to ride in this weekend's endurance ride. Islam is Malaysia's official religion; it arrived here at the end of the 13th century. There's also Buddhism, Christianity, and Hinduism. Here ends your Malaysia lesson.